• For quantitative determination of chromium Cr(VI). • CHROMIUM is widely used in various industries such as electroplating, leather tanning, chrome paint, dying, hardened steel, ceramic and glass industry. Chromium exists in two stable oxidation states, hexavalent Cr(VI) and trivalent Cr(III). Cr(VI) is produced solely by industrial processes, whereas in nature, chromium exists in its trivalent form. Cr(III) is generally regarded as nontoxic due to poor absorption. Cr(VI) is considered a pulmonary carcinogen and has tested positive in genotoxicity tests. It is one of the most serious pollutants in many water streams due to its carcinogenic potential. Most countries apply a legal limit of 50-100 μg/L Cr in drinking water. BioAssay Systems Chromium Assay Kit provides a simple one-step colorimetric means to directly measure Cr(VI) in a sample. In the assay, Cr(VI) forms a stable complex with a specific chromogenic dye. The optical density at 480nm is directly proportionate to the Cr(VI) concentration in the sample. Cr(III) can be converted to Cr(VI) with nitric acid/hydrochloric acid, thus allowing the determination of Cr(III) or total Cr [Cr(III) + Cr(VI)] in the sample. The assay is sensitive with a detection limit of 20 μg/L Cr. 1. We would like to measure chromium which is incorporated into blood as Cr-EDTA. Can we use this kit for such an application? Does EDTA interfere with this assay? We have not explicitly tested the chromium assay kit for EDTA interference, but EDTA is likely to interfere with the formation of the colored chromium complex. However, the general sample treatment procedure (see data sheet) may destroy EDTA and release chromium, making it possible to use the assay for this purpose, but we have not tested that. 2. Could you give me more information about the application and sample preparation of the Cr (VI) kit in the analysis of food samples? 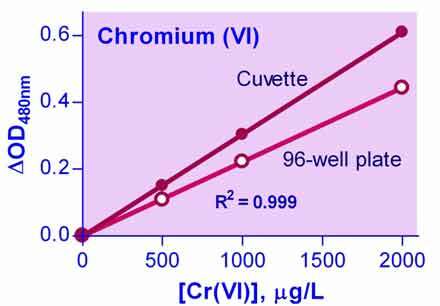 Our Chromium Assay Kit directly measures Cr(VI). Cr(VI) is fully soluble and can be easily extracted into water. Therefore, you only need to add water to your food sample, mix well, centrifuge (14,000 g for 10 min), or filtrate through a Whatman No. 42 paper and use the clear supernatant or filtrate as sample for assay. Since the Cr(VI) concentration in the sample is unknown, it is best to use small amount of water so as to achieve a relatively concentrated extract. If the Cr(VI) concentration in the extract is too high, one can dilute it in water and rerun the assay. If you need to determine Cr(III) or total chromium in your sample, you would need to use the general procedure to convert Cr(III) to Cr(VI).